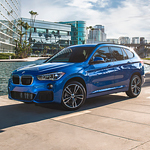 With the BMW X1, the brand brings a durable, rugged, and luxurious vehicle to the market. At BMW of Rochester Hills, we're always pleased to show the X1 to potential customers, as it has a great combination of style and performance. Under the hood, you'll find a powerful engine that can take you anywhere at any time. The X1 engine has 228 horsepower; the sDrive28i model can go from zero to 60 in 6.6 seconds, and the xDrive28i cuts that time down to 6.3 seconds. Along with speed, the vehicle also has great control. It comes with Dynamic Stability Control and Dynamic Traction Control, and the BMW intelligent all-wheel drive system automatically adjusts to the conditions. Technology is present throughout the X1. You can stay connected and entertained with the iDrive system, and if you want to stay focused on the road, you can have a Head-Up Display put in.